The thing I most remember about our first encounter was the dogs' sheer size. At the time, they were five and four years of age—adult dogs made of solid muscle. Keep in mind that I was no stranger to large animals; my background was in the training and daily care of beluga whales, dolphins, primates, large cats, and other species! But, it wasn't just their size. Friend and colleague Dr. Karen London notes that ridgebacks have a "powerful presence" that goes beyond how tall they stand or how much they weigh. Equine thoughts were appropriate when we met; the dogs were the size of small ponies, as far as I was concerned. At home one day, I described how much fun hoof care was with the horses at Brookfield Zoo. I had worked at an equine hospital previously and could still recall how stressed some of the horses became during daily husbandry tasks. Of course they were stressed—they were sick, compromised medically, and, therefore, compromised behaviorally. If I had hurt my finger, I doubt a manicure would be in my immediate plans. But at the zoo, various breeds of horses allowed daily hoof care in exchange for generous amounts of carrots, apples, and grain. Earning the trust of a powerful horse was always first on my agenda in providing any sort of care. "Luca really does not like vet visits," Jim shared. "He was fine until he was about a year old. They accidently hit his quick during a nail trim and he bled all over the exam room. Since then, he becomes very aggressive with any restraint or handling." Luca? Really? I would not have predicted that difficulty, but I had never joined Jim at the vet. We worked with Luca to help improve his learned associations during routine veterinary and grooming care. As resources, we had high-value treats, a little bit of training every day, patience, play, and veterinary staff members who were extremely helpful and worked with us toward our goal. Was Luca fully relaxed for nail trims as we progressed? No. But he improved some when he was allowed make his own choices about what he participated in. We took it one day at a time, one nail at a time. Alternatives to labels, like banking! Some would say that Luca's behavior wasn't unexpected or unusual. Ridgebacks tend to come with labels like dominant, defiant, and difficult. I learned a lot about labeling animals and their behavior, and the detrimental effects of labeling, as a student in Dr. Susan Friedman's Living & Learning with Animals course. (I recommend highly this fantastic course!) Dr. Friedman's article provides additional detail about the problem of labeling. Visiting the vet can be stressful for everyone. There are ways to help rather than hinder the process. Above all, integrate patience, play, toys, and treats (if treats are not contraindicated for the visit). Dogs tend to have increased arousal levels and become easily distracted when they realize they are HERE! AT THE VET! GULP! Pulling back on the leash and raising your voice while giving cues ("sit!" "down!" "stop pulling!") confirm for the dog that aversive or punishing outcomes occur at the very location that elicits stress. Anything you do to raise the dog's stress level adds another reason to associate the veterinary location with bad outcomes. Another consideration is that others in the veterinary clinic are affected by how pet owners manage and train their dogs. If your dog needs space from other people or dogs, call the veterinary front desk staff to arrange a smooth transition into and out of the clinic. Remember that regression is normal in learning—on both ends of the leash. A relaxing vet visit should be the goal for all involved. Unfortunately, I have seen over the years that the bigger the dog (or the horse, or any large animal), the more intense the restraint procedures. And the more intense the procedures, the more nervous and fearful the dogs become with each exposure. The truth is that any breed of dog can become fearful or aggressive during daily handling and care. Add in variables like less-frequent experiences—such as vaccinations, professional grooming, or emergency care—or new veterinary staff or groomers who may not know the puppy, dog, or client very well, and the odds increase. Training requires consistency, as often as possible. But it is also important to train for novelty and for environments where a stimulus may cue the dog to become nervous. In the training I do with animals, we build up a hefty bank account of "savings" through positive training and generous reinforcement. Then, when necessary, we deplete the account a little, like when we trim one nail at a time. Or, we deplete the account a lot, during an emergency visit (when feeding treats is not an option) or during an ear-swabbing to analyze the cause of a painful infection. Our regular veterinarians are wonderful advocates for dogs and cats. They know that shortcuts can lead to more resistance and apprehension the next visit, and that slow and steady wins the race when we have time on our side. Still, during their required rotations I have seen veterinary students shy away from our ridgebacks. "I have yet to meet a dog like this that was OK during exams," said the most recent student. Once bitten, twice shy—I don't blame these students. If in my work, and in the work of others, we can train whales and horses to participate in their own care voluntarily, why can't we do the same for family dogs? Forget the labels, bank "deposits," and prepare for/practice scenarios that have the potential for anxiety! Luca and Clemmy died in 2010. Happily, Santino, our current ridgeback, came into our lives toward the end of Clemmy's time. Santino is one of the best animal teachers I have ever had. Jim and I started clicker training him the very day he arrived in our home, at 9.5 weeks of age. We went through the "three Es" of new puppy ownership: excitement, exhilaration, and exhaustion. The exhaustion waned as Santino matured, and he continues to provide a fourth, "E," education, every day. I made it a personal goal from the moment Santino came home to help him be comfortable with any care he might need. "Free contact" and "protected contact" are the options we use with exotic animals. The animals participate in their care either in the same space as the trainer or from behind a safe barrier. My goal for Santino was free contact with no restraint, and Santino was on board for the challenge. One of our more specific goals for Santino was for him to stand without restraint for a blood draw. Recently, we achieved that goal and our work toward that goal is illustrative of the process that can be used to train any animal for similar circumstances. apply pressure to the site after the needle is removed. In the first video clip, it's clear that training followed the "anyplace/anytime" philosophy! Santino's many preparation sessions took place away from the actual veterinary clinic. Just as you would study for an exam before taking that exam, practice sessions made the eventual trip to the vet more successful. Add "anyone" to the training philosophy as well! We varied the assistant who introduces various props and tactile during training. In video clip #1, friend and colleague Charmaine Anthony plays this integral role. Sometimes we practiced at home, at group classes, or one-on-one at the training center. We observed Santino's canine communication carefully and watched for the smallest signs of stress. All sessions were short in duration with a high rate of reinforcement. We warmed up the clicker, and were generous with the treats. In training, we increased the value of the primary reinforcer (treats) offered to Santino. We started at a high rate of reinforcement. Treat placement varied—either from the floor or from my hand. Treat delivery came more frequently from my hand during blood draw approximations. This choice helped with our positioning and allowed Santino to stand comfortably with an even distribution of body weight. It also improved my view so that I could assess his body language and the introduction of props. The rate of reinforcement was slowed slightly based on several variables, including Santino's ability to demonstrate relaxed canine communication and his ability to stand in position for increased duration. The rate of reinforcement was also impacted by the time Santino took to look back and observe what was happening. Note that treat placement away from the assistant can also help increase an animal's comfort level. In general, treat placement helps to reset the behavior; tossing the treat allows the animal to get out of position to eat and sets up for the next cue. Varying treat placement also provides an animal the opportunity to relieve any pressure created by staying in one location for successive approximations. When a treat is placed away from the trainer after the click, the animal has the choice to return (or not) for more training. The response to the choice helps the trainer assess the animal's comfort level. Is the animal hesitant to return? This is an ideal time to assess criteria based on what the animal's body language is saying. The response to the choice helps the trainer assess the animal's comfort level. Mat training was integrated as a visual and tactile target. The mat can also provide comfortable footing and cues for fluent behaviors. On the mat, we advanced to a mock blood-draw position. Our assistant knelt on the mat with props. Her task was to provide tactile stimulation (touching Santino with props or her hands), an interaction that Santino would become accustomed to during his practice sessions. Once Santino was engaged and standing on the mat, the assistant began tactile at a neutral place (his shoulder). At one point, my foot accidently shifted the chair while Santino was consuming a treat. This startled him, so I cued a few simple behaviors (hand target, sit, down, spin, and another hand target). I changed the "picture" after the simple behaviors were cued by facing Santino toward the assistant. He snuck in a quick sniff that they both seemed to enjoy. The assistant then held up the dry erase marker (our needle "prop") while I continued to cue simple behaviors. I emphasized clear communication at all points, letting the assistant know when Santino was ready for an approximation. In our pre-planning stage, I asked our veterinary staff where they pulled blood: right-rear leg. In training, I had the assistant focus on building duration for the "holding off the vein" tactile in some of the approximations. Throughout training, the assistant approached Santino from various angles and positions, introducing the needle prop slowly and in short durations. Initially, we marked the behavior with a click for tolerating the needle prop (dry erase marker) to Santino's leg, and then for duration of pressure to his rear leg. Santino was empowered by the choice and opportunity to walk away from training at any time. Providing this choice helped to increase Santino's overall comfort level. Space was his friend, and he had plenty of it. At all stages of training, keep in mind that it is important to assess bite inhibition. If a dog is taking treats with increased intensity or with increased signs of canine communication stress, regress and assess. Some dogs will "dine and dash," which means that they are becoming increasingly conflicted about the scenario, grabbing the treat to run away to eat it. These dogs are attempting to create their own space. It's best to grant that space. The second video clip shows additional practice held at a chiropractic appointment. 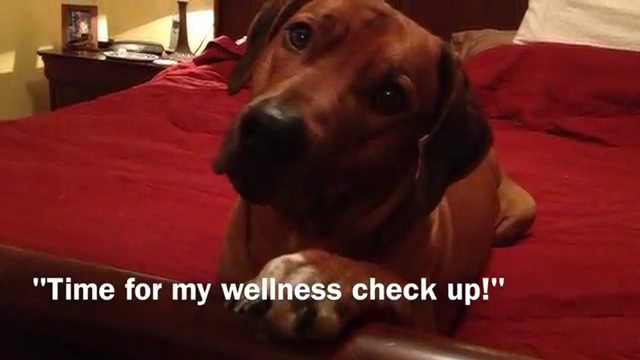 Yes, Santino receives preventive chiropractic care (start this kind of care when dogs are healthy)! We recruited Megan Ridley, DVM, to assist during the appointment. The training at the chiropractic appointment emphasized the "study for the exam before taking the exam" philosophy. The training was more of the same basic principles, this time in the chiropractic setting. We increased the value of Santino's primary reinforcer (treats) and observed carefully his canine communication. We watched for even the smallest signs of stress. Again, we assessed bite inhibition. Props (alcohol bottle, gauze, and sterile needle) were integrated slowly. There was always clear communication among the humans, especially in letting the assistant know when Santino was ready for an approximation. In this video clip, we prepared Santino for the sight, scent, and sound of what was in the bottle. We also prepared Santino for the sight and sound of the needle being removed from its casing, as well as for the needle being presented. Santino looked toward Dr. Ridley as she moved the needle from the sterile casing; I clicked and treated immediately. The site was cleaned with alcohol first, and then needle pressure was applied with the needle cap on (no insertion). Santino remained relaxed and was reinforced for holding his position after the pressure from the needle prop was removed and the site was swabbed with gauze. This last step of the blood draw is a critical behavior to plan and teach. When the blood has been obtained, the veterinary staff needs to swab the injection area and provide gentle pressure to reduce potential bleeding or bruising. The sensation of the needle being removed should not become a cue for Santino to move and walk away! At the end of this practice session, I ping-ponged easy behaviors with Dr. Ridley, concluding on a fun and positive note. In the third training video clip, Santino starts off by discovering that mat training onto a scale is "weigh" too much fun! The weigh-in is required for his annual wellness visit. It is also a fun activity that he is fluent in and enjoys. The weigh-in fit beautifully in to my training plan to cue easy and fun behaviors before and after the blood draw approximations. To accomplish the goals of this part of the training, I increased the value of the primary reinforcer (food). I fed high-value dry treats for Santino's weigh-in, but then placed Easy Cheese into an empty syringe casing for the actual blood draw. Another excellent treat option would be Treattoobs. Tip: Introduce eating out of a food tube before the actual procedure. Create a positive association with this prop with various approximations. Make sure to use a food tube that is sized appropriately for the breed and eating pattern of the individual dog. As always, we watched for the smallest signs of stress and assessed bite inhibition. Again, we observed Santino's canine communication, and kept our own communications clear, particularly when notifying the veterinary staff when Santino was ready for an approximation. A follow hand target was used to get Santino into the blood draw position. Next we increased the rate of reinforcement, presenting the food tube for easy access and consumption of the cheese. At the same time, we worked to keep Santino in a comfortable standing position. Three "pretend pokes" occurred prior to the actual insertion of the butterfly needle. We continued to reinforce Santino for holding his position while the blood draw site was held off and cleaned. Santino has been exposed to many sights, sounds and smells in preparation for various husbandry behaviors, but it is not possible to prepare for every eventuality. The intercom sound in the background of this video clip is an example of an unexpected environmental occurrence that could startle some dogs. At the end of the successful blood draw, we did a lot of fun and quick behaviors and then took a group photo. We ALL felt extremely reinforced! I would like to thank the friends and veterinary colleagues who helped in this wonderful and successful team effort. The location of the actual blood draw was Furnetic/Chicago Center for Veterinary Medicine, a division of the University of Illinois College of Veterinary Medicine. This is also the location for our Ready… Set… for Groomer and Vet! program. Thanks, also, to everyone at Integrative Pet Care in Chicago. As a community, we work best when we collaborate—advocating for our canine friends, honoring their amazing communication system, interacting with like-minded trainers, veterinary professionals, and owners using kindness and patience. It's not always easy balancing each vet clinic's procedures and protocols, as well as client expectations and goals. Trainers with different levels of expertise can help guide the way. We all learn from each another! Laura cuing a layout position for blood-draw behavior. My personal goal for Santino was also a professional goal. Showing, rather than just telling, clients what is possible reinforces me. What else reinforces me? Training dates with my canine buddy, Santino. He really is so much fun. 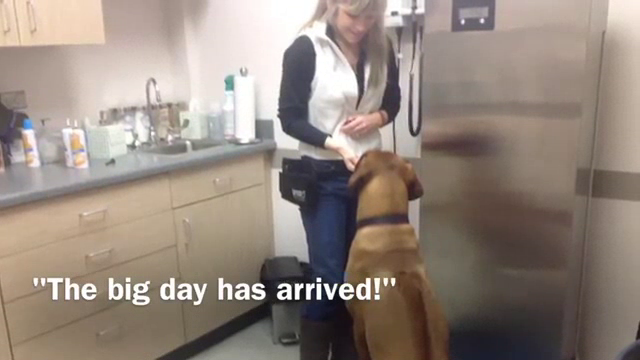 The steps of the shaping plan for Santino's blood draw behavior were fully integrated into daily training sessions. I learned this valuable approach from Ken Ramirez at the Shedd Aquarium. There, a beluga whale learning one approximation toward introducing props (assistant stands near animal, assistant holds props for blood draw, cuing the whale to present its side for tactile without props, and then with props) follows training with a break and some simple, fun behaviors that are fluent and easy. An open-mouth behavior for a tongue scratch is a beluga favorite, as is sliding up on deck for a back rub. Play time is usually an added bonus. Similarly, ping-ponging from a little bit of this (blood-draw approximations) to a little bit of that (spins, play bows, and hand targets) always kept Santino engaged, enthusiastic, and relaxed. Is Santino an ambassador for his breed, the Rhodesian ridgebacks? Perhaps. More importantly, as a professional trainer I am an ambassador for responsible ownership behavior and positive training, no matter the breed, no matter the species. Should dogs still learn to be restrained? Absolutely. There are times when an animal requires immediate emergency care. Dogs (and other pets) should be taught to be relaxed for various levels of tactile restraint. There are many ways to learn more about this topic, including some excellent resources available on Dr. Sophia Yin's website. Are there other proactive, low-stress, and positive variations to teaching medical and grooming behaviors? Absolutely! My goal was to teach a voluntary blood draw using successive approximations as discussed in this article. There is no "one way." As Ken Ramirez often says, training is teaching. Art and science complement each other in exciting and ever-evolving ways. Let's keep evolving together!" In the meantime, Santino and I are on to our next exciting training challenge. I hope you enjoy learning about this one!